The first step in creating an accessible PDF from Microsoft Word is to ensure that the original Word document is accessible. For steps, see Creating Accessible Documents in Microsoft Word. 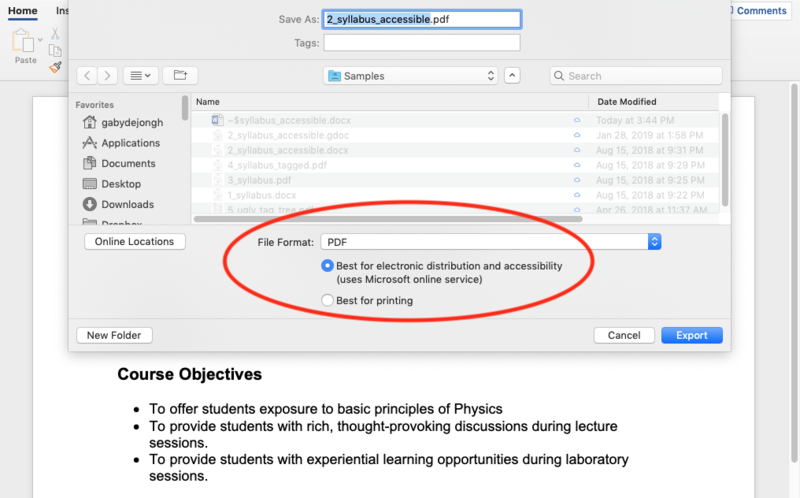 Starting with an accessible Word document, a goal when exporting to PDF is do so in a way that preserves the accessibility features of the Word document, including heading structure, alternate text for images, and markup that explicitly identifies lists, tables, document language, and other content that is important for accessibility. Do not print to PDF. This method of creating a PDF does not preserve the document’s accessibility features. The correct method of exporting to PDF depends on which version of Microsoft Office you’re using. Go to File > “Save As…” and select PDF from the choices provided. By default this produces a PDF that preserves the document’s accessibility features. When saving, select Options and be sure that “Document structure tags for accessibility” is checked. This is checked by default, but could become unchecked under certain circumstances. If you select “Minimize Size” to reduce the size of your PDF, be sure to repeat the preceding step, as this option might uncheck the “Document structure tags for accessibility” checkbox. When saving, be sure the box labeled “Best for electronic distribution and accessibility” is checked. In Windows, exporting to an accessible PDF in Office 2007 and 2003 requires a plug-in. The Adobe PDFMaker Plugin ships with Adobe Acrobat Pro, and the plugin is installed into Office and appears as an Adobe toolbar and menu item. With this plug-in installed, use the Adobe toolbar or the Adobe menu item to Save As PDF. By default this produces a PDF that preserves the document’s accessibility features. On a Mac, Word did not include accessibility features at all until Office 2011, and did not support saving to tagged PDF until Office 2016. In Office 2011, you can create an accessible Word document, but in order to export to tagged PDF you must take that final step in Word for Windows or LibreOffice for Mac.